I jump around between projects. A lot. Over the years, I have employed various methods for retaining state or context as I switch to a different project. Here’s a quick survey and a general classification of their effectiveness. Evernote: This is a cloud-based note-taking service that has a web client, Mac and Windows clients, and clients for just about ever mobile platform out there. I have an account and access it via the web interface as well as the Windows, iOS, and Android clients. I really like it. Series of text files: I have been doing this for a very long time. I have many little note-filled directories here and there that are consistently migrated to new machines but generally forgotten about. This isn’t a terrible method but can be unwieldy when you work on lots of different machines. I’m still tracking down all these directories and importing them into Evernote. Layout of desktop windows: I have a habit of working on one project in a set of windows on one desktop space and another project in a second set of windows in another space, etc. Oh, this makes me shudder just thinking about it, mostly because of living in constant fear of a power failure or some other inadvertent reset (darn you, default config’d Windows Update) that wipes the state clean (sure, all of the work might have been saved, but I was relying on those windows to be set up in just the right manner to remind me of all the things I was working on). These days, I force myself to reboot at least once a week so I can’t get too deep into this habit. When it’s time to change projects, I write up exactly what I was doing and where I left off and stick it in Evernote. Open browser windows: I guess it’s common to have many, many tabs open in one’s web browser in this day and age. Like many, I use open tabs as a stack of items to read. The state problem comes when a few of the open tabs represent TODO items. Then I start living in fear that the browser might crash or be restarted in an unexpected way and I struggle to recall what 3-5 important TODO items were that I had opened in separate tabs (on top of a stack of less important items). Again, I try to shut down the browser frequently in order to break this tendency. TODO items are better filed in Evernote. Unsaved data in a text editor: Okay, this is just sloppy on my part, shoving temporary data into a text editor window thinking it’s supremely ephemeral. The problem comes when it’s linked to one of the many tasks on my desktop that might be bumped down a few priority levels; when finally returning to the context-free data, I’m at a loss to explain what it’s for. Evernote gets it, once more, with a more thorough description of what was going on. Email inbox: I make an effort to ensure that my email inbox has the fewest number of messages possible. Once things are dealt with, they get filed away elsewhere. This implies that things in my inbox require action. Some things have a habit of hanging around, though. Longer items now get described in better detail and filed away in Evernote. Classic paper: Thanks to Derek in the comments for reminding me of this one. Paper is a reliable standby but it can get unwieldy when Post-It Notes litter your work area. Further, it can be problematic when you have multiple physical work areas. Shell history: Another method I rely on entirely too often. This is when I count on a recipe of command line incantations living on in the history buffer of my Unix shell (generally Bash). What sequence of git commands allowed me to do XYZ? Let’s check the shell history– I sure hope it’s still in there. I guess what I’m trying to say here is that I really like Evernote. If you have similar troubles with retaining state, try it out. I hear there are many other services similar to it with slightly varying feature sets (people rave about Microsoft OneNote). So there are plenty of options and something out there is surely a fit. Evernote has a free tier and a premium tier. For my meager note-taking needs, I don’t come anywhere close to the free tier’s limit but I decided to pay for a premium subscription simply because I feel like I derive so much value from the service. One downside, however, is that I seem to be doing a lot less blogging since I got on Evernote earlier this year (though it is where I author most of these posts nowadays; I especially like that I have a notebook labeled “Posted” whose incrementing count reminds me that I am getting some stuff out there). I originally started this blog as a sort of technical journal in order to organize notes and projects in a central location. It’s strange to think that if Evernote existed in 2005, I might never have had a reason to start this blog. Amazon got into the business of selling Android Apps some time ago. I started experimenting with this on a Nexus One phone that Google gave me. When I installed the App Store on the Android tablet and logged in, I was pleasantly surprised to see all of my Amazon apps ready for downloading onto the tablet. So I have an App Store for use with this Android tablet. 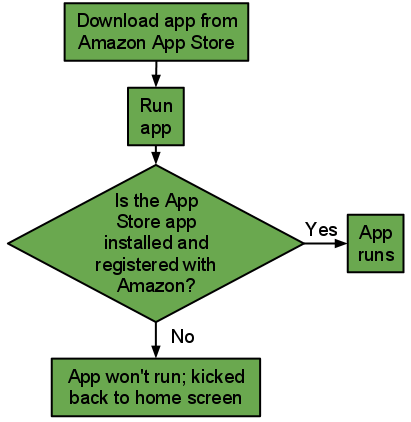 This means that if — perhaps out of curiosity, for example — you login to the Amazon App Store, download an app, install it, and then subsequently log out of the App Store or uninstall it altogether, the downloaded app will decline to run until you log back into the store. Here’s the thing– I wanted to provide a minimal level of security for my Android tablet. At the very least, I wished to lock the Amazon App Store itself since Amazon is famously (and, let’s face it, understandably) reluctant to deliberately add any friction to their shopping processes. I.e., without any external protection app, the App Store app would allow anyone to purchase any app using my tablet. So I purchased App Protector Pro from the Amazon App Store and it worked quite well. By default, it also password protects against modifying any system settings as well as installing new apps. I eventually learned how to perform a factory reset of the unit which solved the problem. And, as indicated earlier, all of my apps were available for me to re-download. Open source aficionados will likely point out that there are alternate firmware options which allow me to take control of my Android tablet in a free and open manner. Among these options is CyanogenMod. After I got stuck in the situation described above, I thought I would have to resort to such an option. On the plus side, researching alternative firmware options is what taught me to boot the device into a recovery mode and ultimately restore to a factory default setting. But if you’ll allow me to indulge in a mini-rant regarding accessibility of open source software: I was more than a little frustrated in trying to understand what CyanogenMod could possibly offer me. Their homepage says it’s “an aftermarket firmware”. I’m not entirely sure what that means or how it can benefit me. Fortunately, they have a full feature list linked from the front page. They are, in order: Lockscreen gestures, phone goggles, OpenVPN, incognito mode, themes support, and DSP equalizer. I can’t say that any of those really add any value for me. I’d love to know if CyanogenMod supports Google Android Market and various other Google apps (such as maps and GMail). That’s a question that I can’t seem to find the answer to. The themes feature opens another old wound for me. Back around 1999 when I was first getting into Linux in a serious way, I remember that themes were a big theme at the Linux User Groups I would attend. I also remember lots are online articles at the time that emphasized how highly customizable the Linux desktop was in comparison to Windows 9x. I was bothered for 2 reasons: First, I thought there were more pressing problems that needed to be addressed in Linux; and second, none of these customization options seemed particularly straightforward; many apparently required hours of compiling and tinkering. Small digression. Anyway, back to CyanogenMod, I was glad to see that they prominently display a button in order to “View Video Tour”. Ah, internet video has us so spoiled these days. I was eager to see this aftermarket firmware in action to see what it could do for me. However, the link leads to… a forum post? The thread seems to discuss how it would be a cool idea if the community could put together a video tour. At this point, the investigation just seems bizarre. It feels like a bunch of kids doing their best to do things the grown-up way. Okay, sorry, rant over. I try to stay positive these days. I’m sure the CyanogenMod folks are doing great, fun, and interesting work on their project. The problems they choose to solve might lack mainstream appeal, however. Ultimately, I recently unloaded the little Android tablet because, well… when a free iPad comes your way, lower spec tablets feel a little silly to keep around. Yeah, it’s great to play around with. Though here’s one unsettling thing I noticed about Apple’s App Store. While browsing for worthwhile games to indulge in, I noticed that they had a section for “Top Grossing Games”. This was a separate list from the “Top Apps” charts. I found the list weird for 2 reasons: 1) Why do I care which games are raking in the most cash? How does this communicate value to me, personally? Seriously, why would I base a purchasing decision around which vendor has earned the most money? Anyway, let’s move on to reason #2 this was scary: Most of the games in this list had a price of FREE. One of them was that Capcom Smurfs game that stirred up controversy some months ago because of kids making unsupervised in-app purchases of virtual smurfberries. I tend to think that a top-grossing, free to play game is probably one that heavily encourages in-app purchases. Strange how this emerging trend actually encourages me to seek out games from the “top paid” list vs. “top free”. I made good on my claim that I would create an RSS feed for the samples repository. Here is the link to the samples RSS feed [ http://samples.mplayerhq.hu/samples-rss.xml ]. Also, here is the Python source code I threw together for the task. I just want to check: I’m not the only person who still relies on RSS these days, right? The tech press has been cheerfully proclaiming its demise for some time now. But then, they have been proclaiming the same for Adobe Flash as well. I’m no expert in RSS. If you have any suggestions for how to improve the features presented in the feed, please let me know. And, of course, keep the samples coming. This script should help provide more visibility for a broader audience. Thanks to LuigiBlood who sent in some samples that allowed me to test out my new script for automatically syncing the repositories and updating the samples RSS feed. First, there are CPC multimedia files from the Japanese 3DO port of Flashback: The Quest for Identity. Then, there is an Interplay MVE file on the CD version of Mario Teaches Typing in which the video doesn’t decode correctly. LuigiBlood also sent in another file from the latter game. It’s big and has the extension .AV. It could be a multimedia file as it appears to have a palette and PCM audio inside. But there’s no header and I’m a bit unsure about how to catalog it.